The results: We love blue and green…and hate brown and yellow! Did you know you forgot pink? Don’t people like different colors for different things? Of course. We actually talk about just that in “Selecting colors for design projects.” But, judging by the number of people who were willing to pick just one, we bet that most people do have one they generally like more than others. For this survey and your answer, think of what color you would select for your personal toothbrush (or something else that only you regularly see) if you saw all these colors offered in the store. And, which color you would never pick. Don’t you think it would be better to be more specific on where people are from, for example, eastern U.S., southern U.S., etc.? No way! In fact, we wish we had just made it a question of which continent you were from so we had more data from each place. There were so few from each country other than the U.S., Canada, Australia, and United Kingdom that we’re not even going to analyze the differences based on culture. If we get more answers from other countries, we’ll share that information. Why do older people like red so much? As our eyes age, we sometimes lose the ability to distinguish between blues and yellows. The color that stands out the most is red, so that may be why we are more drawn to it as we age. Or maybe it was just a cool color when they were growing up in the first half of the 20th century! Can I see the raw data? You bet! Just contact us and we’ll send you the data so you can sort and analyze to your heart’s content. This poll isn’t very scientific, is it? I’m a designer, not a scientist! But it still is interesting to see the differences emerge in the responses we’ve received so far. YES! In fact, we’d love to have you post a link to http://www.surveymonkey.com/s/colorprefs so everyone you know can participate. 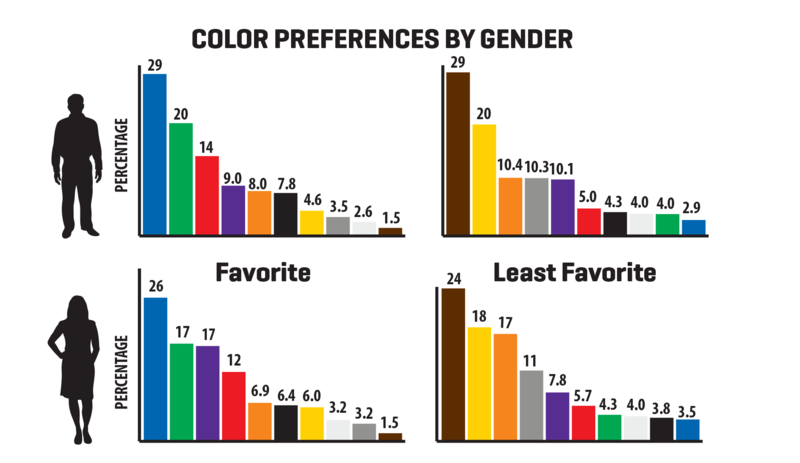 The more responses we get from around the world, the more we can learn about color preferences. Take the one-minute poll, and after you vote, you can see how your answers compare with worldwide favorite colors. → Previous post: What makes a great B2B website? Why don’t more people like yellow? Yellow is awesome! I know. I’m bummed about purple! Yellow is one of my LEAST favorite colors…along with blue and pink! Lol! Come on orange!! Lol! …actually Red-orange is my favorite color…and technically my favorite color is: “Caracas Red”…its a paint color for a car. Lol! Seashell Pink!!!!!!!! and Lilac Purle too! you have got to have Lilac Purple along with Seashell Pink!!!!!!!!!! oh and Auqa Blue or Green, you just have to have Auqa Blue or Green too! and Silvery Gray too, you have to have Silvery Gray too! and Light Lemon Yellow, don’t forget about light Lemon Yellow too! Hi, Albert! Yes, we didn’t put pink in the survey, nor did we put shades of any other colors except grey. Orange, purple, brown, black, white, and grey are all in there, though not very popular! 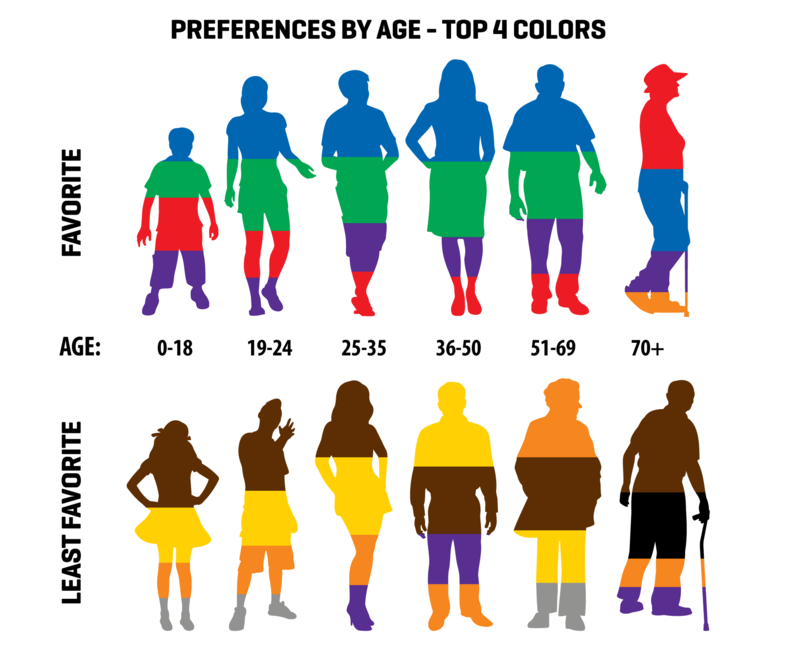 Take a look at the “Preferences by Gender” chart and you’ll see all 10 colors that were included. But, no pink! Although royal cobalt blue is my favorite, you should add pink to your survry.I knowmany that go crazy for pink. And, by crazy, you might mean crazy with love or crazy with hate!